If you have ever paddle boarded at night, you understand the dangers that come with it. Due to the fact that you can’t see,if you paddle in the ocean, the conditions worsened much faster. It is a little safer paddling at night in a lake, but I would still advise against it if you are alone. Regardless of the dangers, people are drawn to getting out and paddle at night. There is nothing better than the calm sound of water in the cool of the night as you gracefully stroke your way around in the dark. If you do choose to go out in the dark, there are a few options and safety measures you can take that can be fun yet still safe. One of these options is to add a SUP LED light kit to your paddle board. WHAT ARE STAND UP PADDLE BOARD LED LIGHTS? These LED kits are designed to improve your visibility and vision in general at night. Trying to carry flashlights or even a head lamp is much more difficult and inconvenient. 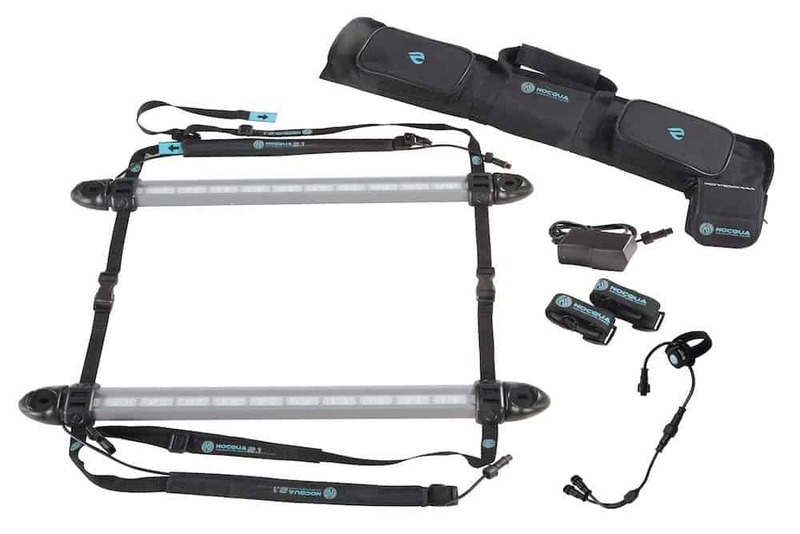 These light kits for SUP’s are typically attached straight to your paddle board. Some kits offer lights that mount below the board so you can light up the water and see some of the amazing creatures lurking below you in the middle of the night. This adds an element of peace and comfort knowing what is beneath you and sometimes wonder of the amazing creatures that you will see that only come out at night. Light kits can attach to more than just your board, they can attach to paddles as well. The light kits also attract fish. So if you are a fisherman who wants to take advantage of being out when others cannot be, this will help you clear out the competition and attract more fish. As far as paddle lights go, they can be strapped to the paddle on a single end or both if you desire. Some people have found the LED paddles to be a little heavier than normal so keep that in mind. The real point of having them is to stay safe or to just look really cool honestly. LED SUP kits are all made differently depending on the company. Some have a built in emergency feature that flickers the lights in case you need help. 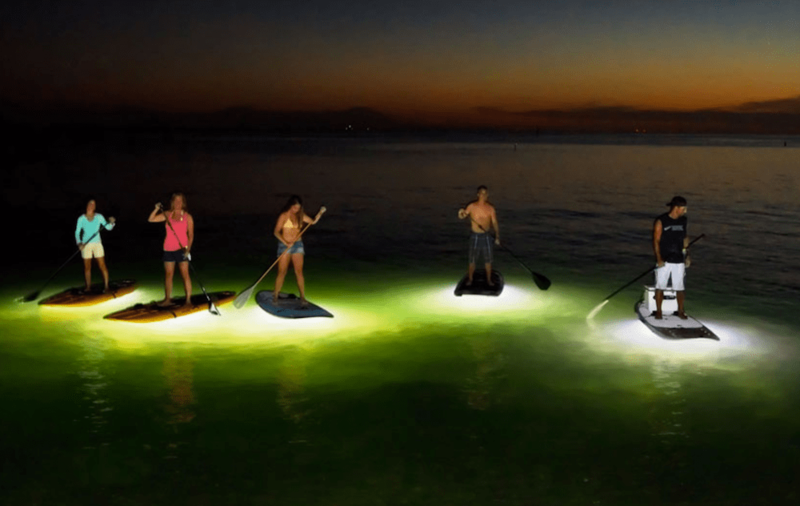 This is a great feature especially if you are considering SUPing in the ocean at night. I would hope that you never paddle at night anywhere alone, so if you do, be sure to bring a friend or group when paddle boarding in the dark. Most of the time, you will have the entire ocean or lake to yourself. Paddle board LED lights are quite bright so visibility into the water is good as well. Some of these kits can be seen from as far as a mile away. LED’s can be crazy bright at times and still only use a little power. Some kits can handle over 200 hours of light on a full charge or new batteries. That should be more than enough time for any length of session. The lights are also shock and water proof as you might have imagined. These SUP LED’s will also mount on any Pedal Board which in reality is really the same as a paddle board outside of the handle bars and drive system. WHAT ARE THE BEST SUP LED LIGHTS? 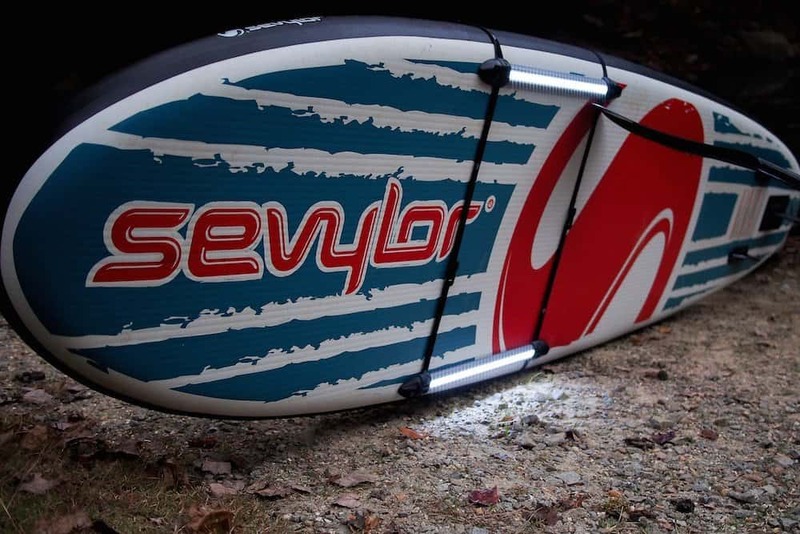 This is one of the most popular and best known paddle board LED light kits out on the market today. It puts out more than 2,000 lumens of lighting power. These lights have a life span of 3 hours on a charge before they will have to be recharged. A full recharge will take 3 to 4 hours before the battery will be full. The charge will be complete when the LED lights on the charging block turn green. Pretty easy to understand. The LED’s are easily removable and can be mounted on a wide range of SUP’s. Just simply charge them up and strap them on your board and you are ready to go. The straps in this kit are fully adjustable which is why they will fit multiple sizes of paddle boards. The light kit also comes complete with a handy travel case to help transport them around if you are traveling or jsut heading to the beach for the day (or maybe night). 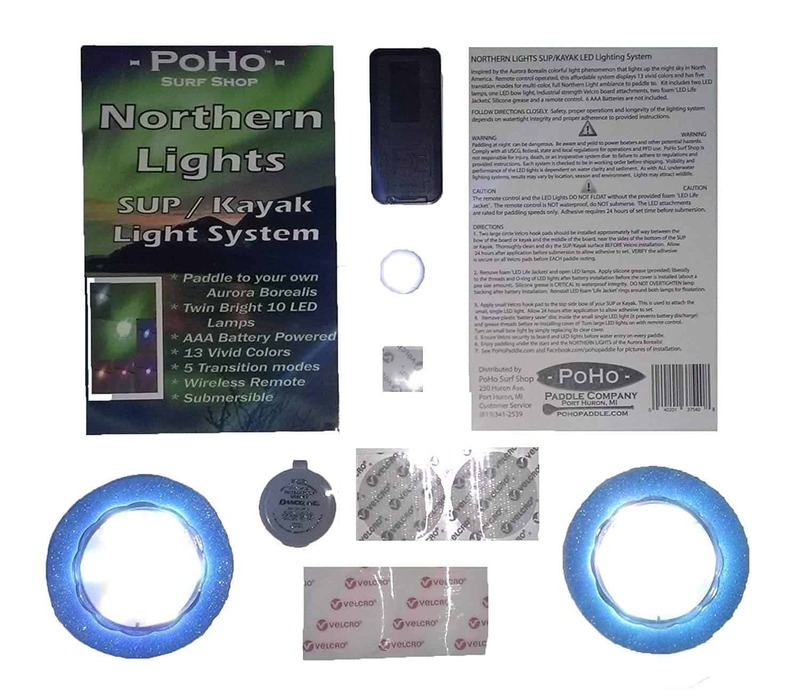 This kit has multicolored lights that are easily strapped right to the bottom of your kayak or board. They are attached with velcro so they can be used with just about all SUP’s. Before attaching the lights to the bottom of your board, be sure to thoroughly clean your board to ensure adhesion. If you don’t not properly clean it, the adhesive could fail and not stick properly. Just in case, the lights all have mini life jackets so they will float and not sink to the bottom. The light kits have five color transition modes and 13 led lamps per unit. You can change the colors at will with the supplied remote control. There is also an adjustment on the remote to alter the speed of transition of the lights. These lights run on six AAA batteries which are not included in the kit. Why not just take things one step further and light up the paddle! This paddle takes 8 AAA batteries which will provide any user with a full 40 hours of well-lit paddling. After 40 hours, you will either need more batteries or invest in some rechargeables. Each paddle has 144 LEDs which gives you 720 Lumens and can light up the water below you as far as 10 meters down. Out of the water, the paddle can light up an area of about 45 meters. 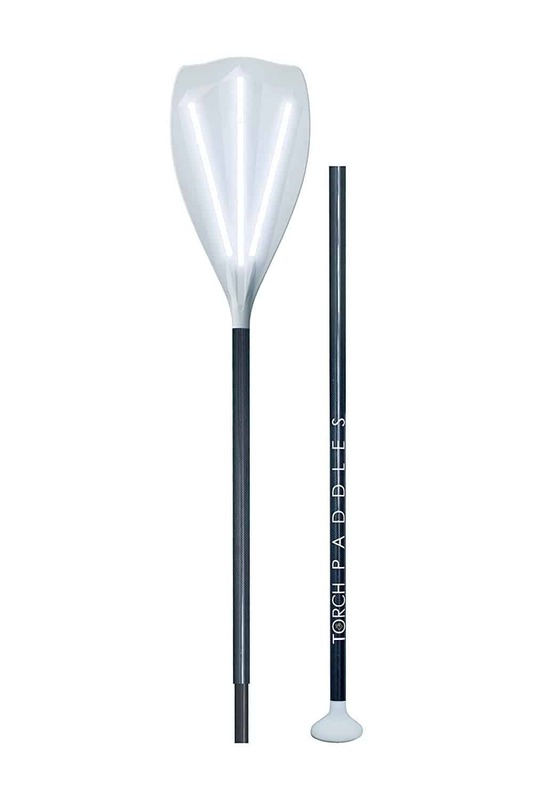 This paddle is made of a 2-Piece shaft made from carbon fiber and fiber glass. 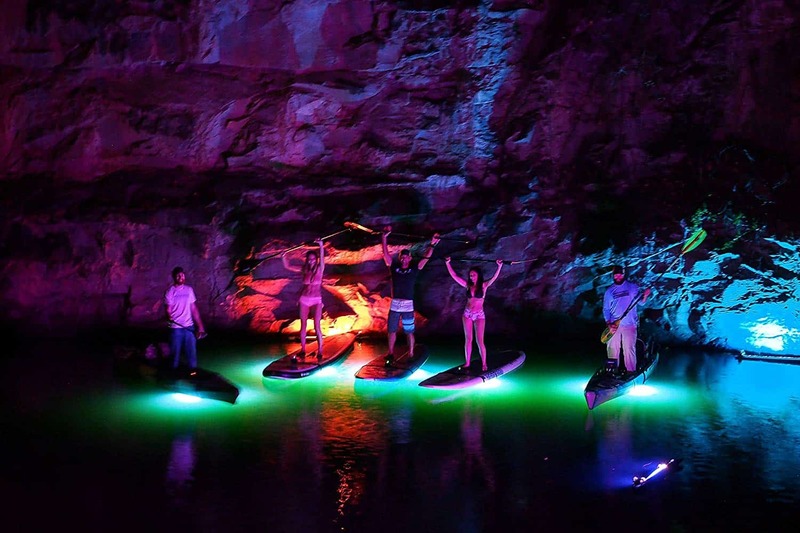 This is just another unique way to light your way through the night on your kayak or paddle board. I have to admit, from far away they look pretty cool as you paddle through the water. Thank you as always for reading. Be sure to check out our other SUP board reviews as well. Please be sure to comment or leave any added thoughts below. Hi. I need paddle boards with LED. Could you please give me prices for 20 paddle boards with LED, and also just 20 LED kits. And 20 Torch sup led paddle. And also how much its to have it in México? As for boards with lights, we do not offer that just yet, but that is a great idea. I may be looking into that. 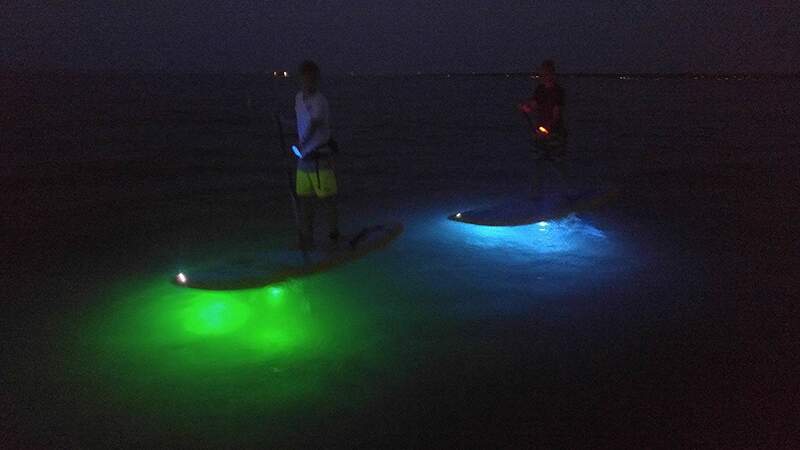 Stand Up Paddle Board LED Lights And Kits	Overall rating:	5	out of 5 based on 5	reviews.